The Wii U often suffers with third party support, since its launch last year it has typically gotten ports of older games with a few additional features. Deus Ex: Human Revolution Director’s Cut goes one step further, bringing with it not only the entire Deus Ex: Human Revolution experience to Nintendo for the first time, but giving it a slew of additional features like DLC, more balanced and altered boss fights, and even some lighting and texture tweaks, and Gamepad functionality to make this version of Human Revolution the best the series has to offer. 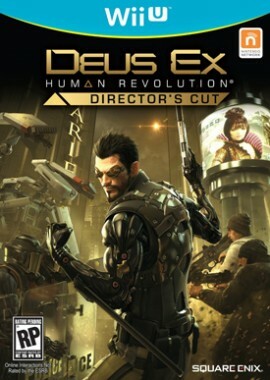 Deus Ex: Human Revolution puts you in the shoes of Adam Jensen, an ex-SWAT officer who is now private security for a large biotechnology company, Sarif Industries. One day when Sarif is attacked, Jensen is practically killed and his on again-off again girlfriend Dr. Megan Reed is captured (suspiciously when she was about to announce her latest breakthrough in human augmentation). Jensen is then fitted with the company’s top of the line augmentation prostetics (including a bitchin’ pair of shades that come out of his face) and returns to work when a Sarif Industries warehouse is attacked. After infiltrating the warehouse and neutralizing the terrorists responsible, Jensen starts globe trotting in search of the group behind the attack, and where Dr. Reed is being kept. The crux of the game takes place in two main areas; Detroit and Shanghai’s Heng Sha. As you play through the game you will unlock more information that will unravel the secrets and story of the game. Much of this info comes from the game’s side-missions, which although optional, do provide a lot of context to the world of Deus Ex. The story is set in a time before the original Deus Ex game, so the world is still coming to terms with human augmentation. There is a lot of symbolism within Deus Ex, and anyone willing to dig hard enough could extrapolate it and create countless essays on its portrayal of the ethics of modern medicine. However, it is not important to deconstruct the plot’s meaning to enjoy the game, and if you just want to enjoy the globe-trotting super soldier trying to save his ex, then you certainly can. 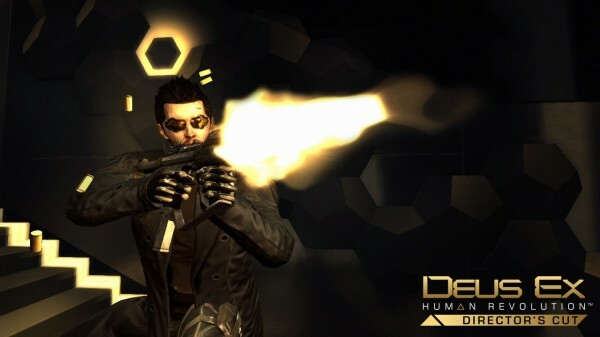 The original Deus Ex: Human Revolution was an open ended, multi-faceted RPG/Shooter that allowed you to build and customise your version of Adam to play how you wanted to play. If you want to play it as a typical FPS then go ahead, is stealth combat more your style, then you can do that too. Nothing much has changed with the overall gameplay for the Dirctor’s Cut, as you are still given the freedom of choice when it comes to your character and how you approach the game. This open-endedness really helps separate the game from others in the same genre, while also encourages replayability. 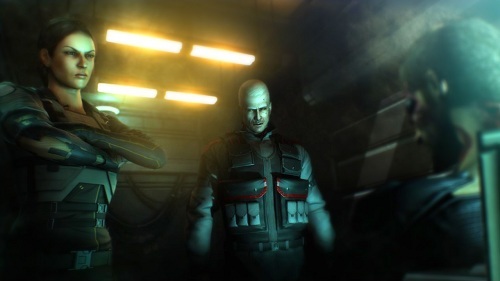 In the original Deus Ex: Human Revolution, the boss fights were seen by many as the weakest part of the game. Not only did they feel out of place to the whole experience, but they also spat in the face of the game’s freedom of choice, heavily favoring players who had built their Adam to be a gun’s blazing Rambo-style character, whole stealth/hack builds were forgotten. This game rectifies that problem, and features some tweaks to the boss battles (some of them more substantial than others). These tweaks and alterations allow for greater balance, and don’t typically favor any one particular play style. A simple fix such as this goes a long way to improving the game overall, and makes these boss encounters feel like they truly belong. The game also contains the entire DLC storyline ‘The Missing Link,’ which is integrated so seamlessly into the plot of Deus Ex that if you didn’t already know, you wouldn’t realise that it was originally an added extra. The Missing Link campaign adds about four hours of playtime, and resets your stats and skills to the beginning, allowing you to play around with builds and skills that you otherwise weren’t using, all without hindering screwing with the character you spent hours building to perfection. The Gamepad is a fantastic asset to this game, as it allows for a lot of clutter that was once on the tv screen. Although it is a common occurrence with Wii U titles, having the game’s map on the second screen is really beneficial to the overall experience. Firstly getting it off of your main screen means it is readily accessible at all times, without imposing on gameplay. Not only that, but it makes locating nearby enemies a tonne easier, as the icons are now much larger and much clearer on this second screen. The game is not without its faults however, and many of these actually stem from the Gamepad integration. Firstly the Gamepad’s rumble option very quickly gets tiresome. Having your controller shake violently every time you pull the trigger of a gun is problematic, especially when you are using a machine gun or other quick firing weapon. Also the touchscreen it self feels unresponsive. This is especially true when navigating menu’s or tutorial hint screens. There is a button that allows you to return to the game, but pressing it often does nothing. After several failed attempts, I usually (and frustratingly) reached for my stylus get back into the action. The fact that the touch screen is unresponsive during these sections is made all the more annoying by the fact that you can’t simply press B to exit out of them. 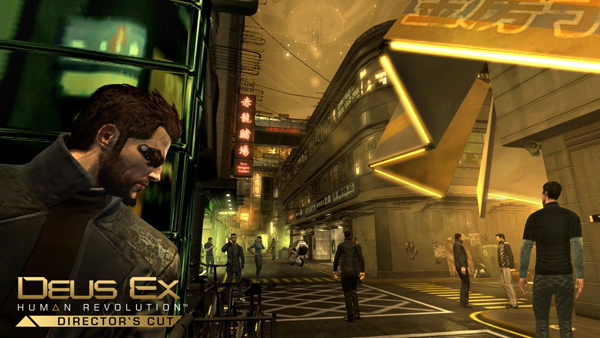 It is hard to talk about the visuals for Deus Ex: Human Revolution. Although the game looks visually appealing, it is still somewhat outdated. Despite the fact that the original came out only 2 years ago, a lot has changed and improved in the way that games are presented since then. Since this is still the same game, not much has actually changed for the presentation, so characters, weapons and landscapes all look the same as they did back then. What has improved is the lighting. Lighting here is more dynamic and fluid which helps to shape the environments and characters better, but also add a sense of realism and immersion to the game. I can’t be too harsh with Deus Ex though, as for its time it was a technical masterpiece. Individually designed NPCs, and furniture and locations all intricately crafted and placed into the world. Even some secret areas and hidden pathways that the majority of players would never see are all unique and stand out. Deus Ex really stands apart from other games that might reuse the same textures or objects time and time again. 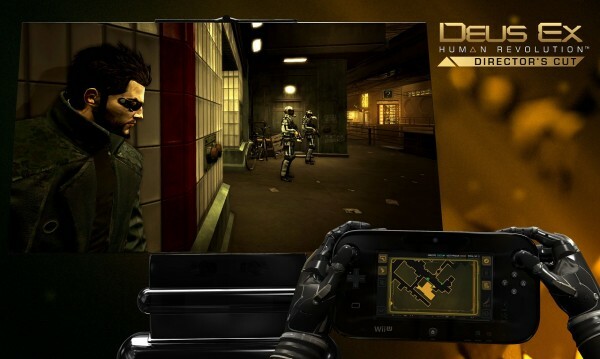 One can’t talk about how Deus Ex: Human Revolution looks without mentioning its distinctive black and gold colour scheme. In a day and age where a lot of games stick to blander colours, the frequent appearance of warmer yellows and golds, really helps the black-clad Adam really stand out. In-game visuals are definitely the most important, but there is still something to be said about the pre-rendered cut scenes. Square Enix published games are typically filled with amazing looking cinematics, and Deus Ex: Human Revolution is no exception to this. Everything looks smooth and polished, and in many cases, downright real. 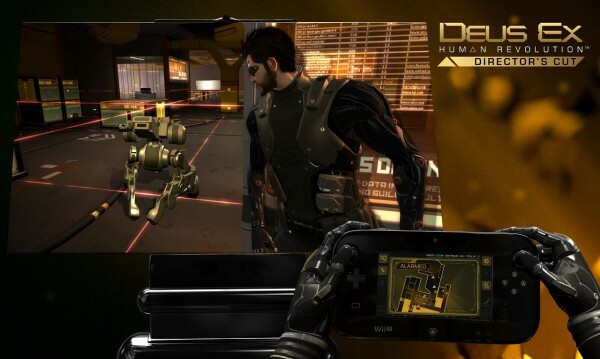 In fact, it would be easy to just enjoy a Deus Ex film made with the visual quality of the cut scenes. Deus Ex: Human Revolution is by and large a story-driven game, and that means that a lot of emphasis is put on the voice acting to tell that story. Luckuly, the voice crew in Human Revolution pull off a fantastic job. Each character is unique, distinct and believable and most of this comes down to their voices. Jensen has that hardened ex-cop sound that you would expect, while Frank Pritchard (the game’s resident IT expert) has that cocky, arrogant swagger that his character needed. While voice acting is important, it can’t be overstated how good the game sounds while you are playing it. Guns go off realistically, with pistols and shotguns sounding how they would in real life. While the more futuristic weaponry takes some liberties, they never sound like toys. The noise of the weapons adds to the realism of the game. Not only do the weapons sound great, but shattering windows and other background noises are all pulled off to near perfection, allowing for a game that sounds as good as it plays. 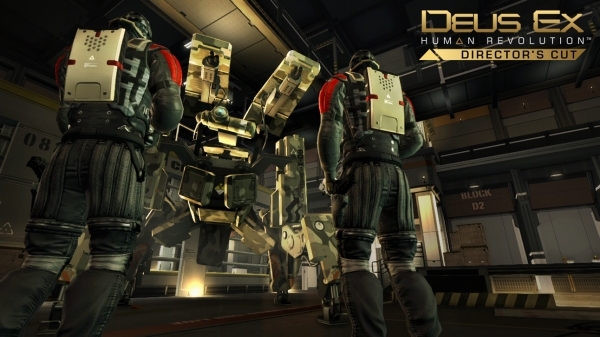 Deus Ex: Human Revolution Director’s Cut takes an already great game and makes it better. From the integration of the Missing Link DLC campaign, and small improvements to things such as lighting lighting, to massive game-changers like the use of the Wii U’s Gamepad, and altered boss battles, Deus Ex has taken a massive step forward. It has its problems, from somewhat outdated visuals, to the Gamepad’s incessant desire to rumble every time you fire a bullet. It is a great package of a great game, and while there isn’t much new here for people who have already purchased it, there is still a lot to like and a lot of reasons to pick this one up.